Carlos Santana’s influence as a PRS artist led to the development of our SE electric guitar series, which launched in 2001. 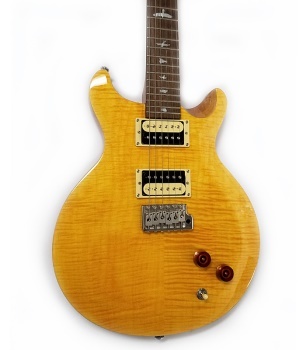 In honor of that legacy, PRS is proud to offer the SE Santana model. The SE Santana features a 24.5” scale length on a 24 fret neck, the PRS patented molded tremolo, Santana "S" humbuckers, and the same Santana body shape silhouette as Santana’s revered American-made PRS models. We believe this guitar and its appointments honor Santana’s skill and style better than ever and offer players great quality and value. Be sure to try an SE Santana when you visit Jackson's Music.